Award-winning Kingscote Wine Estate has gone on the market. 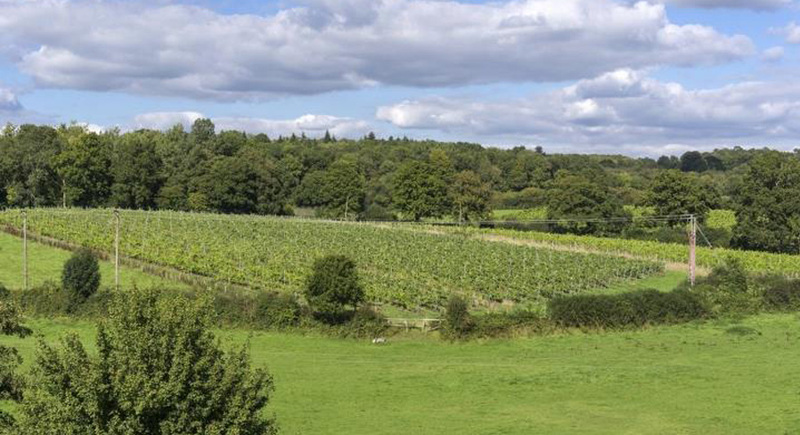 Located in Kingscote Valley, near East Grinstead in Sussex, the Kingscote Wine Estate has been put up for sale, with a purchasing price of £4.5 million. The estate was previously owned by Christen Monge, who, in 1999, quit his job in marketing to follow his dream of planting his own vineyard and building a commercial winery. Monge’s first vines were planted in 2010 on a 15 acre, South-facing site made up of mainly sand, clay and ironstone, in what was once part of famous horticulturist William Robinson’s garden, in the 1,000 acre Gravetye Estate. More vines were added in 2011 and 2013, leaving the Estate with the potential to produce over 100,000 bottles of still and sparkling English wine per year. Plantings include, Chardonnay, Pinot Noir and Pinot Meunier, as well as the more traditional varieties of Bacchus, Pinot Blanc and Regent. Kingscote Estate’s first vintage was released in 2014, using grapes grown in England’s then record-breaking harvest of 2013. All three of their inaugural wines (Fat Fumé 2013, The Bacchus 2013 and Bacchus-Chardonnay 2013) gained international plaudits, as well as a silver and two bronze awards (respectively) in the Decanter World Wine Awards 2015. Sadly, Mr. Monge died of a sudden stroke at age 61, a few days before the awards were announced, prompting the sale of the estate. The still wines of the 2013 vintage are available to buy in the Kingscote Estate shop, or online (though the delicious Fat Fumé has now sold out) with the 2014 vintages on their way soon. These will include Kingscote’s first sparkling wine, due to be released in May 2016, and all are made by one of England’s most experienced and decorated oenologists, Owen Elias, Kingscote’s head winemaker. The grounds also feature a two-acre apple orchard, the fruits of which are used to make Kingscote’s sparkling ‘cyder’, made in the same way as Champagne, in the estate’s winery, receiving a secondary fermentation in-bottle. The 15th century Tythe Barn next to the vineyard has been revamped and refurbished to create a visitor centre and the estate also comprises a Medieval Ironmaster’s house and five-bedroom house, as well as holiday lettings and fishing lakes. The news of the sale of Kingscote Estate, which is being managed by Savills Estate Agent, will no doubt be of interest to many as the reputation and quality in English wines continue to grow. With Taittinger’s purchase of land in Kent to start a vineyard last month, the first Champagne House to do so, others are predicted to follow suit and this award-winning estate could be an interesting opportunity for investors and wine-lovers both in the UK and further afield.